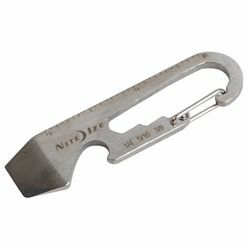 The Nite Ize DoohicKey features a half-dozen tools that do everything from tighten bolts and screws to open a bottle of refreshment, all in a simple key tool that fits in the palm of your hand. Attach it to your keychain or any other ring. Opposite the clip is an etched ruler. The carabiner opening is strategically shaped to function as a wrench. On the other end, the DoohicKey features a bottle opener, a flat head screwdriver and a box cutter.